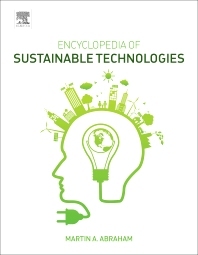 Encyclopedia of Sustainable Technologies provides an authoritative assessment of the sustainable technologies that are currently available or in development. Sustainable technology includes the scientific understanding, development and application of a wide range of technologies and processes and their environmental implications. Systems and lifecycle analyses of energy systems, environmental management, agriculture, manufacturing and digital technologies provide a comprehensive method for understanding the full sustainability of processes. In addition, the development of clean processes through green chemistry and engineering techniques are also described. The book is the first multi-volume reference work to employ both Life Cycle Analysis (LCA) and Triple Bottom Line (TBL) approaches to assessing the wide range of technologies available and their impact upon the world. Both approaches are long established and widely recognized, playing a key role in the organizing principles of this valuable work. Dr. Martin Abraham joined Youngstown State University (YSU) as Professor of Chemical Engineering and Founding Dean of the College of Science, Technology, Engineering and Mathematics in July 2007 and was named Provost and Vice-President for Academic Affairs in July 2015. At YSU, he has led the integration of research and technology transfer across the disciplines, in cooperation with regional business partners, has expanded the role of research at the University, led the formation of an Honour’s College, and supported the growth in international recruitment and programs. The primary research focus area has been green engineering and sustainability, with an emphasis on issues of sustainable energy. Abraham has over 70 refereed publications and over 30 additional publications; he has authored/edited nine books, has participated in three patent applications, and has given over 100 technical presentations. He has supervised 26 Master’s students, 12 PhD graduates, and three visiting scientists and post-doctoral students. He was selected as the 2012 Business Advocate of the Year by the Youngstown/Warren Regional Chamber of Commerce, and serves on the Board for the Youngstown Business Incubator and Mercy Health Systems, Youngstown. He is a Fellow of the American Chemical Society and the American Institute of Chemical Engineers, and a registered Professional Engineer.